After months of media speculation Lotus announced the latest addition to the family: the extraordinary new Lotus Exige S, the ultimate lightweight high performance sportscar. Alongside the staggering power to weight ratio, the Lotus Exige S has a completely new exterior and interior look and feel. The dramatic styling overhaul sees a completely new look for the Exige including a new front splitter and rear spoiler giving it a strong and aerodynamic profile. The all-new Exige S is powered by a mid-mount V6 3.5L 24 Valve engine that delivers 345 hp of power and 400 Nm of torque. With this powerful engine, the car shoots from 0 to 100km/h in 3.8 seconds, reaches 160km/h (100mph) in another 4.1 seconds and has a maximum speed of 274 km/h (170mph). Raw performance, agility, unparalleled ride and handling and mind blowing drive experience, these attributes are what people have come to expect from Lotus. And we don't like to disappoint. After months of media speculation Group Lotus is proud to announce the latest addition to the family: the extraordinary new Lotus Exige S, the ultimate lightweight high performance sportscar. Alongside the staggering power to weight ratio, the Lotus Exige S has a completely new exterior and interior look and feel. The dramatic styling overhaul sees a completely new look for the Exige including a new front splitter and rear spoiler giving it a strong and aerodynamic profile. There are two new interior package options available: Premium and Premium Sport. The Premium Pack provides added comfort and style where as the Premium Sport option focuses on creating an internal space optimised for ultimate driver involvement. Built for the adrenalin hungry sportscar aficionado, the Lotus Exige S features high performance bespoke tyre package with Pirelli P-Zero Corsa tyres as standard. A Lotus DPM (Dynamic Performance Management) switch allows the driver to switch between three driving modes: Touring, Sport and DPM off. And if three dynamic settings are not enough, an additional Race Pack option is available which adds a fourth driving mode setting: Race. This setting provides the maximum possible traction out of corners. The Race Pack also features Launch Control and an optimised suspension setting making the car perfect for letting rip on the track. Commenting on the Exige S, Group Lotus Chief Executive Officer Dany Bahar said: "Anyone who has ever driven an Exige will tell you that it's not for the faint-hearted. The new Exige S skips a few rungs on the ladder to give the driver the ultimate Lotus experience. 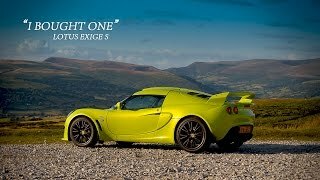 Quite simply you can't get more Lotus than the Exige S."